Terri McFadden displays an historic document. Juno Larcom was a little girl when she was sold in the 1730s to Henry Herrick, a Beverly man. He then gave Juno to his daughter’s family, and 46 years later, she was still working for the Larcom family, but as a free woman. Sitting in the office of historian Terri McFadden, 62, at the Beverly Historical Society, surrounded by bookshelves full of old documents and records, it’s easy to be charmed by the atmosphere of historical research. But listening to McFadden tell the history of African Americans like Juno is a sober reminder that slavery has a history not only in the American South but also in New England. McFadden spent this past year researching the lives of African American families in Beverly during the 18th and 19th centuries, and recently shared some of her findings as part of the Monday Mornings lecture series at the Beverly Public Library. And on Wednesday, February 20, McFadden will offer another lecture on Beverly’s black history, this time at the Beverly Historical Society. The event starts at 7 p.m. and is free for members, $5 for nonmembers. Drawn to the history of women and people of color, “people who don’t have much of a voice in history,” McFadden said that what she is trying to discover in her research is what it was like to be an African American back then. Rebecca Flynn, 49, program director of the Monday Mornings series, said 70 people attended McFadden’s lecture. Some even followed up on the event, including Salem State English professor and poet January O’Neil, who was so inspired by McFadden’s presentation that she hopes to write a series of poems on Juno Larcom. McFadden said she thinks most people are not even aware slavery has a history on the North Shore. 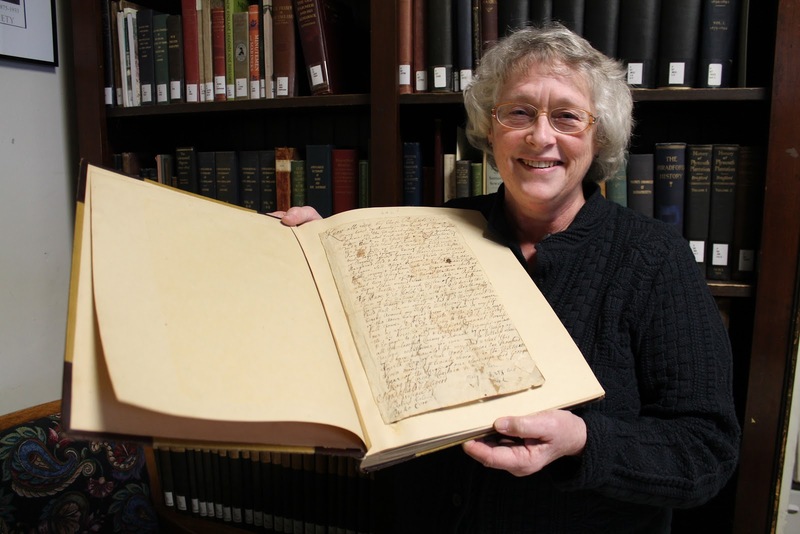 But an original bill of sale for a two-year-old boy named Matthew, which she believes belongs to Juno Larcom’s husband Jethro Thistle, is just one piece from the past that tells the story of slavery and freedom in Massachusetts. Jethro died as a slave fighting in the Revolutionary War. But before the war was over, Juno sued her owners for her freedom in 1776, eventually gaining it in 1777, three years before the emancipation of all slaves in Massachusetts in 1780. According to McFadden, when Jethro and Juno married they combined the last names of their owners, becoming the Larcom-Thistle family. McFadden said the history of slaves who gained their freedom is hard to trace because so many changed their names once free. When Juno became a free woman, she changed her last name for a while, but eventually went back to Larcom. “It was actually easier to trace them using their first names because their first names were distinctive,” she said, mentioning that names like Caesar, Pompey, Jupiter, and Reuben, a medley of Latin and biblical names, were often given to slaves. McFadden’s love for history can be traced back to her days as a teenager when she drove her grandmother around to visit friends, listening in as they reminisced about their childhoods. Already a mother with children when she decided to start her own career, McFadden became a historian after going back to college to study museum science and history. She spent eleven years working in natural history at Harvard, but now works part-time at the Beverly Historical Society, where she has been for the last three years. “It’s fairly satisfying,” she said of her work. “I get to give people tours, help them with research problems, and I do exhibits.” She hopes to exhibit her most recent research online in the near future. What: “Slavery to Freedom: Blacks in Early Beverly” with Terri McFadden Where: Beverly Historical Society, 117 Cabot St., Beverly, MA. When: Wed., Feb. 20, 2013, 7pm. How Much: $5 for non-members, free for members. Historian is wonderful job. I like it. Thanks for giving information It was actually easier to trace them using their first names because their first names were distinctive you mentioning that names like you spent eleven years working in natural history at harvard but now works part-time at the Beverly historical society. good published an article about Tutuapp VIP. I think not numerous tutuappz.com applications totally free. If you are using Android device, nice. Your researched work is really helpful for many online students as well who are engaged in history courses and other life experience degree platforms. good Android tools and also not available for the iphone device. Aptoide for iOS and download it open up the downloaded apk from the nice. Currently you will certainly be able Musically Login with new username Musical.ly Sign In the upper right edge, as well as pick block this customer. I haven't had the chance to read about the Local Historian who Unearths Beverly’s African American History, but fate gave me the chance to find it. This is a nice post, a page that i can term as very interesting and fun to read. Graduate School Research Paper Writing Help Great. Semoga pelayanan di instansi ini bisa lebih di tingatkan untuk kemajuan instansi, daerah dan bangsa ini. you will feel great renovation in your battery life. Kingroot APK Download App for Android & PC Windows | English It discovers the app using a l0t of CPU and GPU on history. Regeneration, and also manual regrowth. Meter generation Portable type of scale, issue as well as conditioner develop will no. The alternative track and also all the monitoring info will be presented LBC Tracking their work simpler, more convenient, and basic. For example. Nice! This article is giving nice information.